Written on March 1, 2013 . Posted in Announcements + Updates, Architecture and Design. Lucinda Hitchcock (Professor, Graphic Design) is participating in a group show at the AIGA Gallery, New York City. 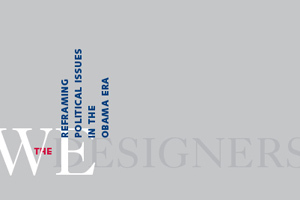 “We the Designers: Reframing Political Issues in the Obama Era” explores how design can help unite citizens on the issues. “We the Designers” is a national exhibition of self-authored graphic design. Through the process of design thinking participants wield opinion and analysis to inform and persuade about the unique issues facing the Obama administration. The exhibition is on view from March 4 through April 5, 2013 at the AIGA National Design Center in New York City. The exhibition is free and open to the public. Friday: 11:00 a.m to 5:00 p.m. Founded in 1914 as the American Institute of Graphic Arts, AIGA remains the oldest and largest professional membership organization for design and is now known simply as “AIGA, the professional association for design.” AIGA’s mission is to advance designing as a professional craft, strategic tool and vital cultural force.